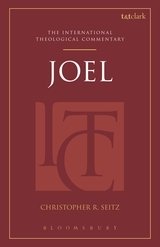 Bloomsbury T&T Clark are delighted to announce that our new International Theological Commentary Series launches today with the first title in the series: Joel ITC by Professor Christopher Seitz, Professor of Biblical Interpretation at Wycliffe College, the University of Toronto in Canada. 1. This is a brand new series for Bloomsbury T&T Clark. Can you briefly describe it? The T&T Clark International Theological Commentary seeks to provide theological commentaries on every book of the Bible as well as on other classic texts of the Christian tradition. 2. This new series complements our established T&T Clark International Critical Commentary Series. How does it differ from and add to this series? 3. What did it mean to you to establish a new series with Bloomsbury T&T Clark? 4. Which aspect of setting up the new series most excited you? i.e. was it the prospect of teasing out previously unexplored areas of traditionally studies biblical books? Or the potential of working with specific people on particular topics? 5. How much sway do the individual authors have for shaping their specific volumes? Is there a template way to approach the biblical books that characterises the series or does this differ in response to the different challenges posed by each biblical book? 6. What was the biggest challenge you faced in outlining the series, and where does this series stand in the field of biblical studies? 7. How did you begin planning the series? Was it with a wish list of authors and topics? If yes, what were you on the lookout for in particular? 8. To conclude, in brief: what can readers (that might surprise them!) expect from books in this series? If you would like to find out more about the series, then click HERE or on the pictures of the editors above! If you'd like to buy a copy of Joel ITC, published today, then click the picture!